BLACKSBURG, VA. – No. 15 Clemson scored six runs in the first inning and added five runs in the seventh inning after the Hokies rallied to within a run in its 12-9 victory over Virginia Tech at Union Park on Sunday afternoon. The Tigers, who swept the series 3-0, improved to 22-6 overall and 9-3 in the ACC. The Hokies fell to 16-12 overall and 4-8 in ACC play. The Tigers scored six runs in the first inning on Bryar Hawkins two-run single, Bo Majkowski’s run-scoring double and Bryce Teodosio’s three-run homer, his eighth of the season. 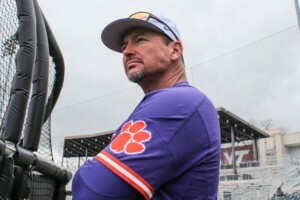 After Kyle Wilkie lofted a sacrifice fly in the second inning to give Clemson a 7-0 lead, the Hokies scored two unearned runs in the third inning without a hit, three runs in the fourth inning and a run in the fifth inning to narrow Clemson’s lead to 7-6.